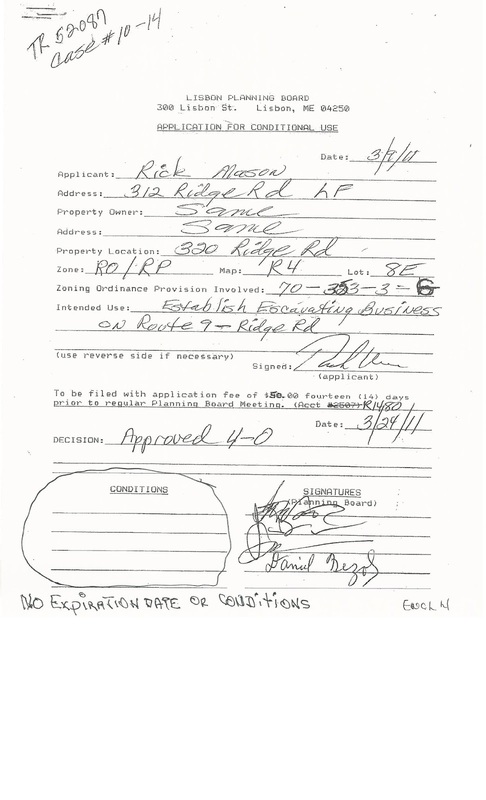 While Mrs. Gina Mason was a member of the Town Council, her husband Mr. Rick Mason applied for a “Conditional Use” permit to operate his excavation business from his residence at 312 Ridge Road, Lisbon Falls, back in March 9, 2011. 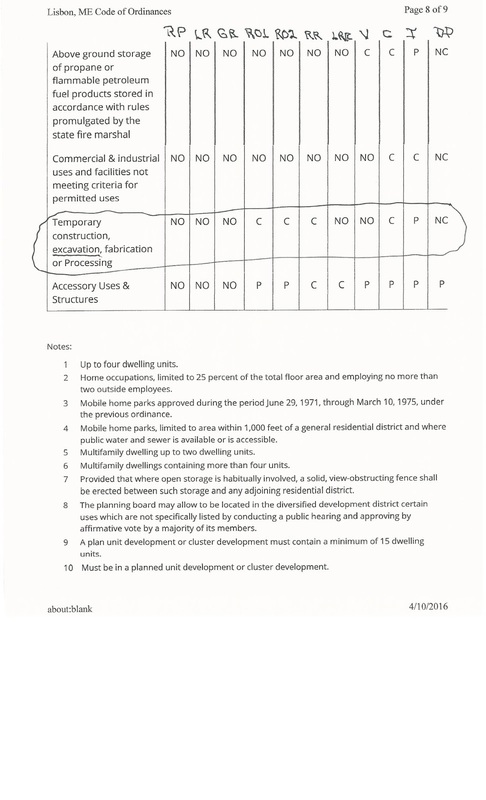 This Application was approved by the Planning Board on March 24, 2011 by a vote of 4-0. The problem with this application is that it is for a temporary condition and this application has no expiration date. How can you have a temporary condition without an expiration date? Next, if you look at the form there is nothing listed in the “Conditions” block? Again, how is it possible to have a Conditional Use permit with no conditions? It kind of defeats the whole purpose; doesn’t it? 312 Ridge Road is zoned as Rural Open I, so there are limited businesses that can operated legally in this zone. Excavating is not one of them but under the Table of Land Use it can operate on a “Temporary” base. I have included a copy of the Land Use Table that applies. The Planning Board approved this application without an expiration date on a temporary condition and never listed any conditions. I do not believe this document is legal. Now, Mr. Mason came to a Town Council meeting and wants to sell automobiles from his property. This is strictly forbidden by the Comprehensive Plan, the zoning for Rural Open I, and the Table of Land Use. However, being a member of the “Good Old Boys” network apparently has advantages as demonstrated by the Planning Board approval for his excavating business. Are we going to allow the “Good Old Boys” network to continue to violate our Comprehensive Plan, Zoning and Table of Land Use just to make one of its members happy? 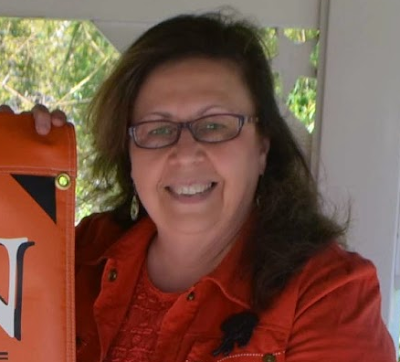 The town is opening itself to law suits just to appease members of their network. There goes ours legal fees!!!! The Town Council and the Planning Board should be held accountable to ensure the Comprehensive Plan, our Zoning, and the Table of Land Use is enforced by our Code Enforcement Officer. The Code Enforcement Officer has to have the complete support of the town in order to do his job. This will protect the town from law suits.